The Pearl of Scandinavia is a large floating hotel, housing more than 2000 passengers. The price range is from €200 for a round trip ticket in the cheapest cabins, but you may easily spend €600-700 for a Commodore class cabin. 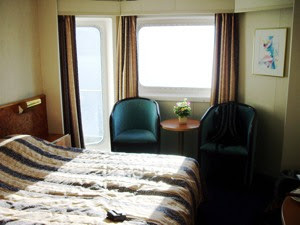 I enjoyed a Commodore cabin with a view, breakfast and a small bottle of Sparkling wine included in the price. Reception, restaurant, room and other areas were squeeky clean! If you compare the size of the cabin with an ordinary hotel room, you will find it quite small. But as I have travelled on different classes earlier I will know that my cabin had a decent size. And it had two large windows making it light and airy. It had a good airconditioning system, TV, Minibar, two chairs and a little table and a desk. However, the design was a little outdated. The bathroom was tiled, but very small, and it had no space to place your personal belongings. But you were served a chilled bottle of sparkling wine on departure from Copenhagen and Oslo. The breakfast buffet is included in the price. You could hardly expect more. Fresh bread and rolls, coffes served in a french press can, scrambled eggs, crisp bacon, and other warm alternatives, as well as cured meats, ham, cheeses, and much more. The only thing to put the finger on, is once again the orange juice. A small swimming pool and hot tub at the rear end of the ship. Very small and difficult to get access to during peak season, I would believe. There is a cinema on board where you can enjoy some of the latest filmes for DKK 40 pr. person. There are several bars, nightclubs, dicos, ans three gourmet restaurants as well as a café and a bistro. Is it worth the price? Paying €600 for a commodore class cabin for one- no! I could get cheap airfare and two or more night in another European destinaton at the same price. For two - maybe, but I would have expected more space for that sum of money. For €200 in a another cabin - yes! But my rating reflects the price you have to pay for a Commodore class room. A nice getaway for the weekend, but you have to pay much for the little extras.